My dog, Rex, is one year old. We have had him since he was a puppy. He is not supposed to sit on the furniture but he was waiting for my husband to come and frustrated because I could not take him out to play. Hello Kris, what a great German Shepherd Dog story. He is an absolutely stunning German Shepherd Dog by the way. 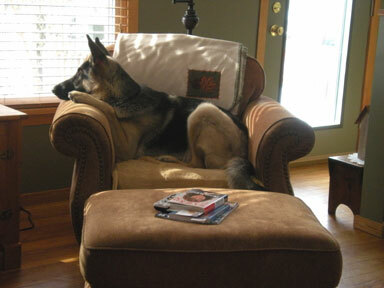 And thank you so much for sharing your great GSD story about your wonderful German Shepherd puppy Rex. And what a wonderful picture - I absolutely love it! Rex looks so intent on whatever he is looking at or for. But it is a beautiful shot - even if you caught him in a bad thing. Dogs!!! You just got to Love them. They are so Loyal and so is your Rex! So is my Mia, she is posted too German Shepherd Puppy Mia.